Disclaimer – Obviously we sell these upgrades ourselves so it would be in our interest to give them a glowing review. However, I aim to stay as objective as possible in the review. Gamers in the USA and Canada are often envious of the RGB compatible SCART standard that pretty much all our consumer grade TVs have had for decades now. SCART is a simple, effective way of carrying a RGB signal but it’s not without its problems. Quite apart from being a thoroughly confusing standard (as we explain here), packing all those wires closely together in one cable can cause interference. If you’ve used a Super Nintendo/Super Famicom console and played an old Konami title, for instance, with that iconic old logo on a white background, you’ve probably heard an annoying buzz in the audio that becomes very noticeable when the screen is at its brightest. Despite trying all manner of enhanced SCART cables, there seemed no way to completely eliminate this annoying phenomenon, until now that is. The Super Nintendo SPDIF upgrade board by Borti 4398 gives your SNES or Super Famicom console a plug and play digital audio connector. 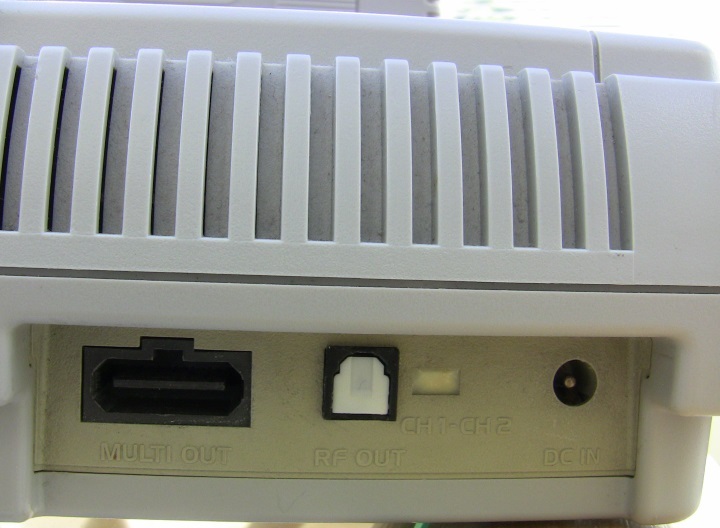 You may be familiar with this style of connector from the Xbox, Xbox 360, PS2 or PS3. Virtually every modern Hi-Fi/home theatre system has an input suitable for this type of connector. To install the part, typically you would remove the old RF modulator from the console and mount the SPDIF board in its place, if you purchase a fitting service from us that’s exactly what our technician will do, giving the console a nice, professional looking finish. Once installed, the part really is plug and play. Simply connect an optical cable between your SNES and your amp, DAC or video processor and you’re good to go. Audio from the console will then be routed both to the regular analogue audio out (which is completely unaffected by this mod) and the digital audio output. SNES digital audio board fitted by our technician. So, does the upgrade sound any better? First of all if you’re expecting your SNES to suddenly sound much crisper then you may be disappointed. Pairing the SNES with a good analogue and digital audio system that processes stereo material well, we thought the sound from the digital output was a little better, but honestly we would struggle to tell the difference in a double-blind style test. Where this upgrade does excel is cutting out analogue interference. Put simply, there is now no audio noise whatsoever, no matter what SCART cable you use and no matter how loud you crank the volume. This drastically improves sound quality whenever you play a game with a particularly bright scene. Even when the SNES graphics aren’t particularly bright, there’s always some noise present in the analogue audio that you can notice at higher volumes, so for the purpose of eliminating that annoying phenomenon once and for all, the upgrade works fantastically. If the SPDIF mod sounds like it’s for you, there are some things you need to keep in mind before you upgrade your classic Nintendo console. Firstly, while the mod works with all of the SNES back catalogue of games, there are some instances where you cannot use it. The Super Game Boy player, for instance, has its own audio chip that bypasses the SNES own. Because of this, Game Boy audio can only be passed through the analogue output and will not work with this upgrade. Secondly, home-brew game titles that use the “MSU Audio” chip on the SD2SNES flash cartridge will not work with the digital audio mod. If you’ve read our SD2SNES review, you will know that the cartridge is a clever bit of kit that can actually simulate many of the custom chips that were found inside SNES games. MSU Audio is a simulation of a chip that never actually existed as real silicon, but can upgrade the consoles audio output. Again, because this chip bypasses the regular sound output of the SNES, it’s not compatible with the digital audio upgrade. You can still play these games using the regular analogue audio output of course. The second issue is compatibility. We’ve been told that because the SNES consoles digital output is a little off-spec, some amps/receivers will simply reject it. That said, we’ve not actually found one yet that isn’t compatible. The table below lists some hardware we tested and we’ll aim to keep adding data as we get it. The final issue you should keep in mind is the “Silent Streaming bug”. This is a common problem on optical AV receivers when handling Linear PCM audio streams. Basically, on some AV equipment, when the digital audio stream goes completely silent, the amplifier/receiver loses the connection. When the audio starts up again, the amp takes a moment to ‘wake up’ and the first half a second or so of the audio is lost. This affects games more than it does music, since they are more likely to have these periods of audio stopping and starting suddenly. It’s not a phenomenon that’s peculiar to the SNES either, the PS2 in particular suffers from this issue in a number of games. If you believe you have an amp that has this issue, note that it will likely rear its head on a number of SNES games. Of course, the analogue audio is still entirely usable so you can always fall back to that if you encounter this issue on a certain game. While we can’t call the SNES SPDIF mod an essential upgrade, it is one that makes an appreciable difference to audio quality in a number of games. If you want the very best SNES experience on original hardware and you have a compatible receiver or DAC, you should definitely consider the digital audio upgrade. SNES SPDIF/Digital Audio Upgrade is available from our store as a DIY kit. You can also send us your console and have our technician professionally install it for you. If you are interested in the upgrade, contact me here and I will pop your name onto the waiting list. Remember this is an open source design, so if you’re confident with electronics, you can find the schematics and build your own by visiting the Github page here. Crystal clear, noise free audio for your classic console. Can you elaborate on how exactly it is off-spec? That way perhaps we could figure out whether our equipment is compatible without actually buying it first. Wish I could, but I don’t know the technical details unfortunately. It’s probably sonething to do with the bitrate or sampling rate of SNES audio being lower than Red Book CD standard. The SNES native sampling rates is 32.040 kHz instead of the 32.000 kHz standard, as such some receivers won’t work or will work but with issues with it. I wouldn’t be surprised if all AV Receivers from Sony and Onkyo released in the past 10 years are compatible with 32.040 kHz though, seeing as how the Sony STR-DN840 and STR-DN860 as well as the Onkyo TX-NR656 and Onkyo TX-SR507 are all confirmed to work. I also just confirmed that the Onkyo TX-SR805 is also compatible with the SNES native sampling rate. @ Lawer, the SNES native sample rate isn’t 32,040Hz. The sound is sampled at a flat 32Khz. However, the timing crystal changes the playback rate (not the sampling rate), and can actually be a wide swing from below 32,000Hz to well above 32,100Hz. The timing crystal is going to be different from console to console. I’ve modded two SNES decks and measured the timing. One was 32,055Hz, and the other was 32,121Hz. However, my own raw digital recordings show that the base 32Khz sample rate remains intact, and you can reset the playback rate to 32Khz flat if you’re ripping sound files digitally. Plus in a direct comparison with levels carefully matched (nice that the analog still works) I find separation and detail better going trough my DACs.